CASCO — For the first time in Maine State Ballet’s history, two of the ballerinas sharing the role of the Sugar Plum Fairy in “The Nutcracker” will have more in common than the role — they are also sisters. Rhiannon and Adrienne Pelletier grew up in Raymond and have danced at Maine State Ballet since they were young. Older sister Rhiannon played the Sugar Plum Fairy for the past five years while Adrienne played Clara for six. They are sharing the role of the Sugar Plum Fairy this year, along with Julia Lopez. Adrienne is excited to play the Sugar Plum Fairy this year, a role she understudied last year. “I was really nervous at first because it’s a big deal, and moving on from Clara was outside my comfort zone. But I’m starting to really find a place within this role,” she said. Still, Clara holds a special place in Adrienne’s heart after she fell in love with the role when she first saw “The Nutcracker” at age 4. “My sister was in awe of the Sugar Plum Fairy, and I was in awe of Clara,” she said. The role is special, she explained, because Clara remains onstage for the entire ballet. “You just stop thinking about your nerves, and you have to do it,” she said. Rhiannon loves the Sugar Plum Fairy because it’s “so iconic. Everybody knows the Sugar Plum Fairy, everybody knows the story of ‘The Nutcracker.’ To get to perform that is truly an honor,” she said. Rhiannon lives in Casco and is the owner and artistic director of Maine Dance Center in Raymond. Adrienne lives in Portland and studies business at the University of Southern Maine. Both teach classes at Maine State Ballet and Maine Dance Center. They still find time to rehearse in their busy schedules. Rhiannon said that having played the role for five years, her preparation has decreased over time. “When I first started, my partner and I would come in to rehearse almost every afternoon before the rest of the company arrived. Sometimes we’d run it after as well, twice a day if we had the energy, for the months leading up to the production,” she explained. This year, she and her partner Michael Hamilton both work day jobs, so they practice less often, but they began practicing in August to make up for it. Adrienne feels she is rehearsing less now than she did for Clara because that role necessitates knowing so many scenes. Still, “my body is definitely feeling the amount of rehearsals we’ve been doing,” she said. Adrienne said sharing a role with her sister helps her prepare for it. “It’s really comforting because roles have little things you have to discover about them as you’re going through the rehearsal process. I had the luxury of just asking my sister,” she said. This is the first time the sisters are sharing a partner for the same role. “We’re able to talk to each other about what’s not going right, what we need to work on. Having that kind of buddy has been really fun,” Rhiannon said. Adrienne said while some people expect siblings to be competitive, she and her sister are not. “My sister and I have been dancing together for so long that we’re not struggling with that at all, and we’re always excited to watch each other dance,” she said. At only 23 and 21, the Pelletiers have no end in sight for their dancing careers. “We’re going to keep it up as long as we can,” Rhiannon said. This year, there will be 11 performances of “The Nutcracker” over three weekends, from Nov. 23 to Dec. 9. Tickets are between $20 and $70, with discounts available for groups, seniors and children. They can be purchased through Porttix or at the Merrill Auditorium Box Office. 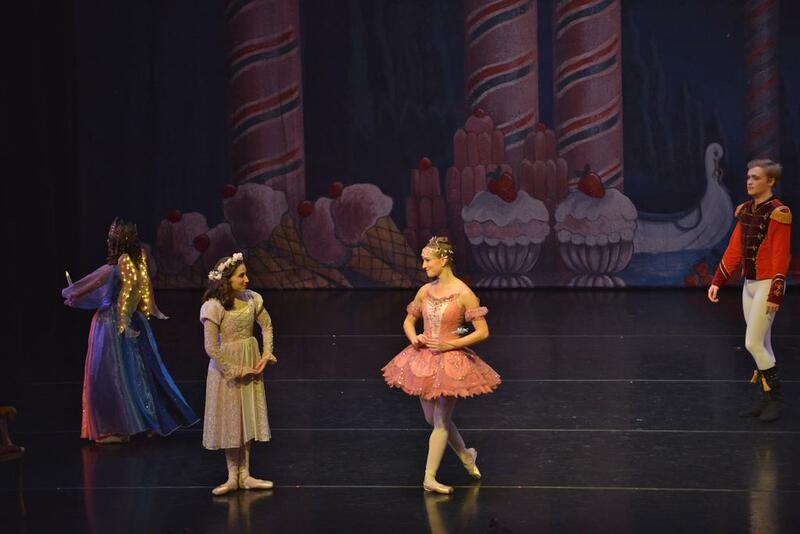 Last year, Adrienne Pelletier, left, played Clara beside her sister Rhiannon, the Sugar Plum Fairy.